Time to start Lofting the hull panels. 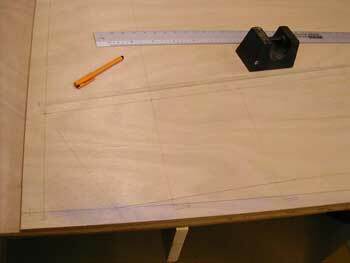 First you need to mark a 200mm grid onto the ply. I snap'd a string line 25mm from the board edge the length of the board and then constructed a perpendicular line using the 3-4-5 rule. As you can see the blue chalk goes everywhere. 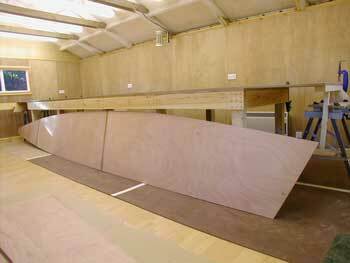 Then added lines parallel to this at 200mm pitch covering the length of the panel to be lofted. At each station the panel edge heights are plotted and a smooth curve fitted to them using a plastic spline. I was fortunate to locates some splines from a work colleague but alas the ducks had wandered. So it was hands knees and feet and any heavy objects I could locate. The result was quite pleasing but at 48" this spline was really too short. So I've resorted to making my own, 72" long from clear polythene with a section of 4x12mm. 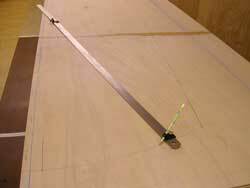 The stern radius at ~1.5m was constructed with a 2m steel rule and a Trend 'Tri-Scribe'. I lofted only one of each of the bottom and side panels. To guarantee that both pairs of panels are identical I superimposed the two sheets and to ensure they didn't move relative to each other I doweled them together using 8mm plastic pins epoxy'd in place, one at each end. Then I cut through both sheets using the lofted lines on the top panel. I try to cut to within 1/16" or 3/32" of the line and finish to the line with a low angle block plane. 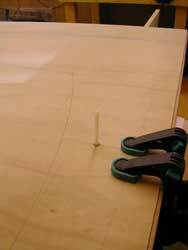 The more confident you are of jig sawing plumb then the closer you can cut to the line. 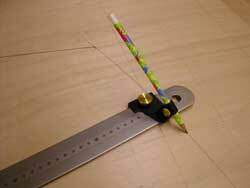 The courser the blade pitch the more likely the cut is to be plumb. Blunt blades won't give a plumb cut as you tend to push the saw. I change the blades frequently, they're only £1.50 each and the total cost of the ply I'm cutting is ~£500!